We are supposed to be able to model teaching with a stick in the sand. Showing that parents need no special equipment, that they can just write out memory work for their children. (blah, blah, get to the white board already lady). So, at hardware stores they have available showerboard/whiteboard. It's not magnetic :(, but hey we're simple. So I had the hubs bring home a large piece of showerboard. 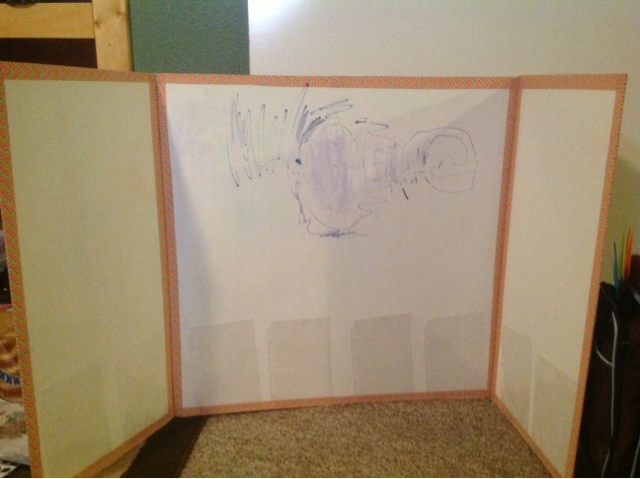 I had figured out what size I wanted my traveling whiteboard to be. It's about 4'w by 3' h when folded up. That is the size of the center panel. So divide 4 by 2 and you get the size of the two side panels 2'x3'. When you go to cut the shower board be aware that your saw should be coming from the brown back side. Our saw made a line down the white side when we ran the saw along the front. Then take a pencil and lay it between the center panel and one of the side pieces on the top and bottom. The pencils space out the boards so when you use your handy-dandy duct tape as a hinge the boards will be spaced enough to close. Tape along the front, remove the pencils, then tape the back. Then do the other side panel in like manner. I also went around the whole opened up trifold with tape just for a finished edge. I folded it around the edges. Maybe I should give a visual so you have some clue what I'm jabbering about. You can see along the bottom edge I have plastic sleeves for the timeline cards (8, 1 from the previous week, and 7 from the current week). I currently have the attached by one clear self adhesive hook and loop disc at the top. However, I shall be adding a second on the bottom in order to keep them from swaying. One other adjustment yet to be made is putting a handle on top. The plan is two drill holes handle width apart and use those hiking clip things... what are they called? Come on brain. Thanks to a search engine, not my brain, the name is carabiner. Place a carabiner through the two layers of the folded board and somehow make a handle between the carabiners. Ooh, idea. I could use my jumbo size cushioned carabiner as the handle. Those "mommy" clip things that are supposed to hold all your grocery bags. I'm sure my "instructions" for the "handle" are quite clear. So, clear that I'll post again to show the finished product. I don't want you thinking I'm as crazy as I sound. We had a bunch of leftover showerboard since hubby bought the super size. So, I had him cut them into individual whiteboards for each student in my class. 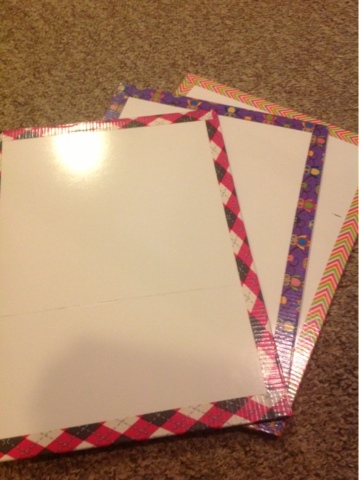 I also finished the edges with fun tape. I thought I said this was a simple post. I may not have been completely accurate. Hi ther! I found your blog on Pinterest. I too am a CC Tutor, this will be my 2nd year. I tutored Mater's boys and girls and this year it looks like I will be moving down to Apprentices or Jurneymen. Tank you for your posts. I hope you keep posting, I would love to see your ideas. I'm having to figure out what to do with younger ones!! Thanks again!!! Hi There, I too, am a a CC tutor and I love reading about all your great ideas! 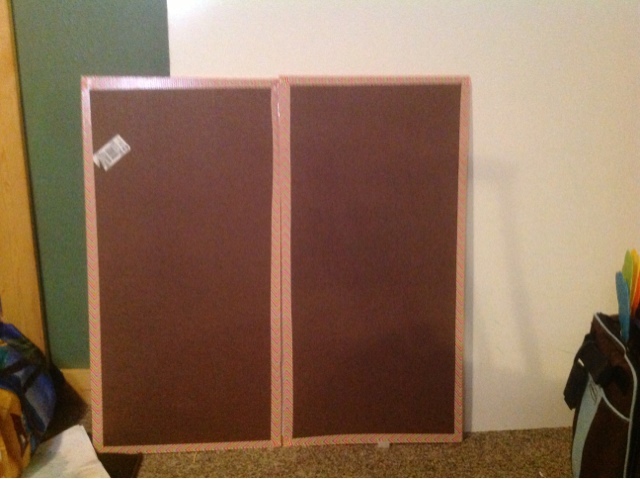 I am curious about your "traveling white board", how will you be displaying the board for your class? Will you be having it sit on the floor or will you use a table or stand? Shelly, I will have it sitting in the front of the room on a small table. I have seen another tutor put a foam trifold board onto a couple chairs in front of the student table. I hope that is helpful. I should take a picture of my setup on the morning of our first cc. That might help with some ideas as well. Did you ever add the handles with caribiners? Could you link to a pic?